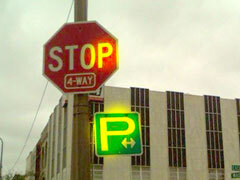 "P" for Parking sign in Owosso, MI. The P is pulled out of proportion. The first time I noticed the green P sign in Owosso, MI, I thought it was trying to tell me that the road was going to make some weird loop back onto itself. After a few seconds I suspected it might actually have to do with parking (which, of course, it does). It was one of those mini lessons in typography, and yesterday I finally got around to taking a picture of it (thanks Tom for letting me use your phone). The problem with the sign is that whoever designed it stretched the letter “P,” malforming it just enough where I, as someone new to this area, failed to immediately recognize it for what it is. This photo was worth taking because it showed a standard “P” in the stop sign next to the malformed “P” in the parking sign.